Wal-Mart’s leaked emails could be just the beginning of bad news for the retail industry. 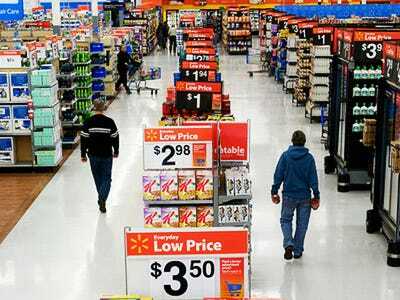 The emails, leaked by Bloomberg, revealed that Walmart executives were freaking out because people weren’t shopping as much. But there’s a fundamental problem that seems to be spreading throughout the discount industry as a whole: customers are broke. Thanks to the recent payroll tax hike, the poorest are running out of money entirely, reports Renee Dudley at Bloomberg. Family Dollar, Target, and grocery stores are experiencing a similar problem, Strasser told Bloomberg. When the payroll-tax break expired at the end of last year, Americans started paying 2 percentage points more in Social Security taxes on their first $113,700 in wages, Dudley reported. That’s $60 a month for someone making $40,000 a year. Walmart shoppers are the “barometer of the U.S. consumer,” Brian Sozzi, chief equities analyst at NBG Productions, told us. If the world’s largest retail is struggling, other businesses definitely are. “There’s no reason to be optimistic,” Sozzi told us. The Wal-Mart emails “could indicate a broader issue,” Dudley reported. “Maybe the payroll tax is a bigger deal than any of us thought,” Brian Yarbrough, an analyst at Edward Jones, told Bloomberg.